Kennel cough is actually a generic name for a gamut of bacteria and viruses that produce upper respiratory infectious disease in dogs. Your dog can develop kennel cough if he has inhaled viral or bacterial particles. Parainfluenza virus is the most common virus that causes kennel cough in dogs. This virus will cause mild symptoms lasting less than 6 days. Bordetella bronchiseptica is the most common bacteria that causes kennel cough. A dog infected with the bacteria usually shows symptoms 2-14 days after exposure, and the symptoms will last around 10 days. Kennel cough is contagious in dogs. Fortunately, most cases of kennel cough are not serious and the dog will get over the cough in 1 to 3 weeks. Kennel cough usually affects stressed young dogs, especially those with a weak immune system. Dogs with a strong immune system do not easily get infected even if they inhale bacterial or viral particles because their respiratory tracts have a healthy protective mucus lining. However, the mucus lining can be weakened by factors such as extreme cold, pollution (e.g. from dust, cigarette smoke, etc. ), and stress (e.g. prolonged stay at kennels). Particularly vulnerable are those dogs cooped up in boarding kennels, pet shops, hospitals, etc. Therefore, if your dog stays home most of the time, it is less likely that she will be affected. Most dogs show symptoms of kennel cough within 3-10 days of exposure. If unfortunately your dog is infected and is developing a cough, it is best to let the condition run its course. 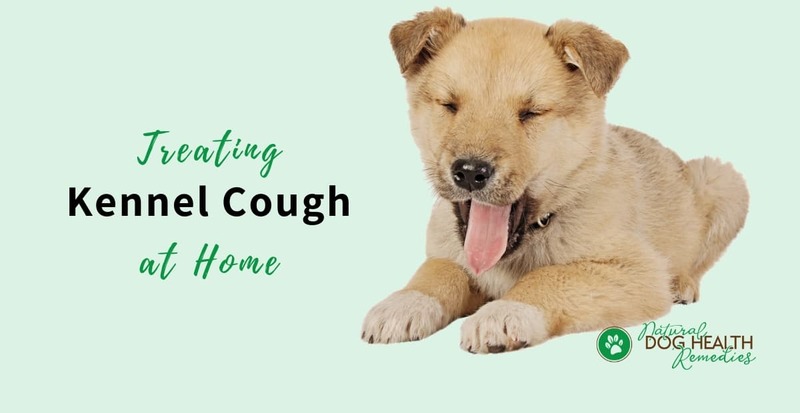 For mild cases of kennel cough, we can definitely use home remedies to control and manage the symptoms so many the dog can feel more comfortable. Vitamins are essential in treating kennel cough. Specifically, vitamin C which is antiviral and vitamin E which supports the immune system are effective in treating kennel cough. Recommended dosages for vitamin C: 125-500 mg twice daily for small dogs; 250-1,500 mg twice daily for medium dogs; 500-1,500 mg twice daily for large dogs. For vitamin E, give between 100IU and 400 IU twice daily depending on size. 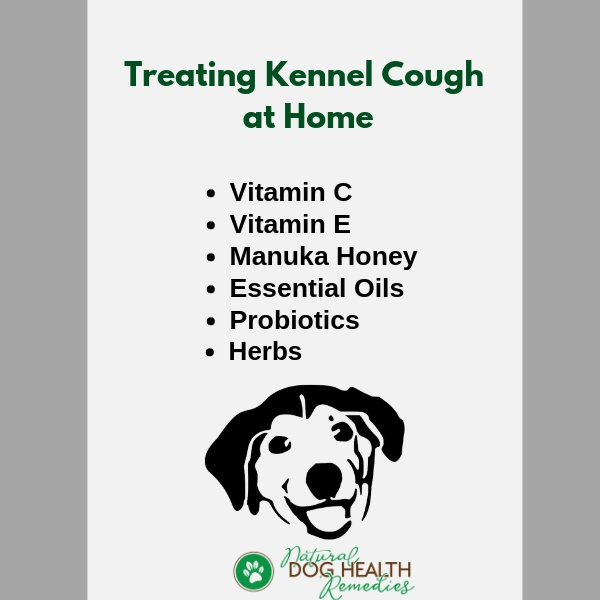 To soothe the honking cough, try giving your dog some manuka honey. Not only is manuka honey soothing for the throat, it is also antibacterial and antiviral and can speed up recovery from a case of kennel cough. For a more soothing effect, try adding 5 to 10 drops (depending on dog's size) of a tincture of the herb Licorice Root to the manuka honey. Licorice is soothing to the mucous membranes and has long been used to alleviate coughs. Essential oils can help your dog relax and breathe easier. Use essential oils that have antibacterial and antiviral properties, such as lavender, niaouli, and eucalyptus. Also add a few drops of chamomile oil for its calming effect. Use them in a vaporizer or diffuser in the room where you dog rests. In addition, consider using probiotics to strengthen the dog's immune system. Dogs with strong immunity are more able to fight off infections quickly. Probiotics strengthen a dog's gastrointestinal system, which is the first line of defense against bacteria, viruses, and other pathogens. Use an herbal remedy such as Throat Gold - Cough & Throat Soother for dogs (Affiliate link). This herbal remedy contains throat soothing herbs such as mullein leaf and slippery elm, as well as immune boosting herbs such as ginger and licorice, and more. Together, all the herbs in the formula work synergistically to calm coughing, soothe the throat, and boost the immune system. Dogs that have weak immune systems are more likely to get infectious respiratory disease such as kennel cough. It follows that to prevent kennel cough, your should boost your dog's immune system. If necessary, immune-boosting herbs such as echinacea and astragalus can be used to enhance a dog's immune system. This all natural herbal formula contains immune boosting herbs such as Echinacea, Elderflower, Goldenseal, Lemon Balm, Licorice, and more and can greatly help a dog weakened by infections such as kennel cough. How About Vaccination for Kennel Cough? 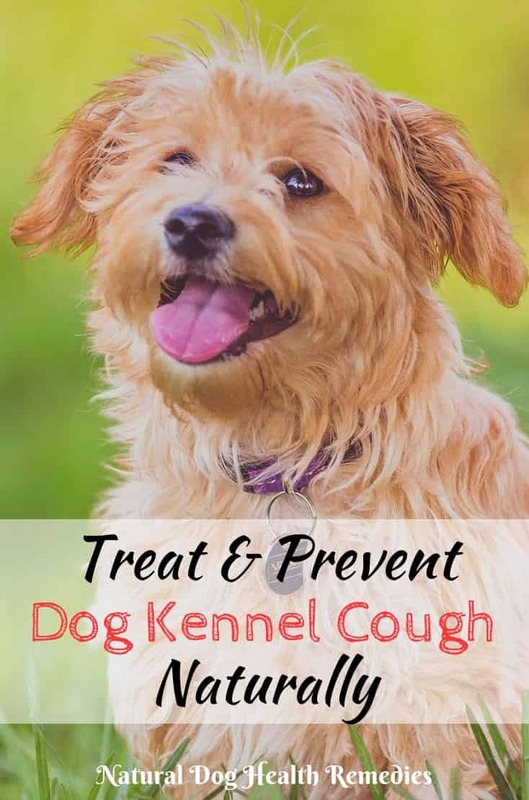 Since most cases of kennel cough are self-limiting, most holistic veterinarians are of the opinion that vaccination is not necessary - especially if your dog is healthy and is not frequently boarded at kennels. Over-vaccination can do more harm to our dogs and as such we should only limit vaccination to the bare minimum. However, if for whatever reason, you do decide to vaccinate your dog against kennel cough, it is recommended that intranasal vaccine be used instead of the injectable form. The intranasal vaccine is administered by squirting the vaccine up a dog's nose. Intranasal vaccines for bordetella activate a pathogen-fighting protein (called interferon) in the dog's body, while the injectable form does not. The interferon then helps to cross-protect the dog against other respiratory pathogens, so you get more protection from the intranasal form than the injectable form. According to Dr. Jean Dodds, a veterinarian well known for her research in vaccinations, if you have to vacccinate your dog against kennel cough, ask your vet for an intranasal vaccine that also contains a vaccine for CAV-2, a strain of canine adenovirus that affects the respiratory tract. CAV-2 vaccine also protects a dog from the more serious CAV-1 virus that causes canine hepatitis. Therefore, your dog will be protected against 3 different possible infections by just one intranasal vaccine. Learn more about other common causes of coughing in dogs.